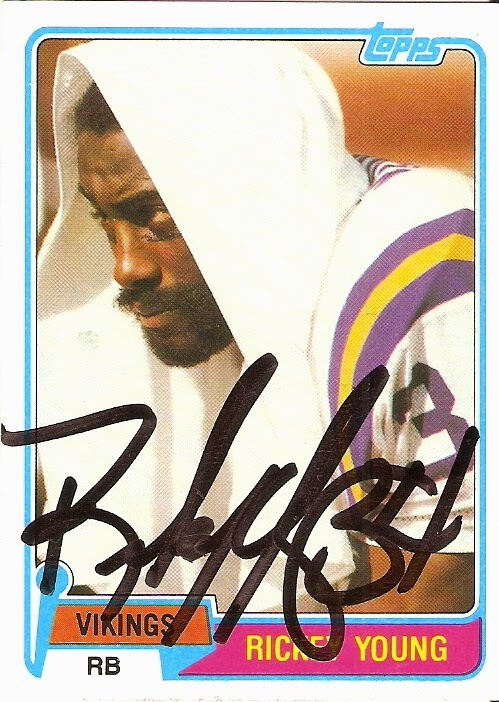 Alongside Dave Osborn at the Minnesota Sports Holiday Show was another former Vikings running back, Rickey Young, who signed this 1981 Topps card. Young played college football at Jackson State, but he wasn't the best running back on his team. That distinction went to Walter Payton. Still, Young managed to do well enough to make it to the NFL, being drafted in the 7th round (164th overall) of the 1975 NFL draft by the San Diego Chargers. After three years in San Diego, he was traded to the Vikings, and in his first year in Minnesota, Young led the league in receptions, with 88. Young retired after the 1983 season, capping off a 9-year NFL career.